Classic City Mama: Mid-Week Randoms. Hey y'all! 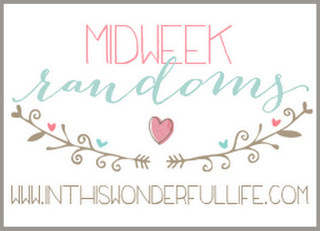 I'm linking up with Megan today for Mid-Week Randoms! (1) This week officially marked "back to school" for me. Even though the kids don't come back until next Wednesday I am already feeling the exhaustion set in. It's SO hard to get back in the groove of teaching after having the summer off. (2) Check back tomorrow for a really awesome giveaway! (3) Jessica and I went out and took outfit pictures of *some* of our Jcrew Warehouse sale purchases on Sunday to share with y'all. but.. my camera was on a weird setting and the lighting was bad so we couldn't tell they were blurry until we got them on the computer #bloggerfail. Hopefully we will have a chance this week to get back out and take a few. We are dying to share our purchases!! (4) I have been doing the Women in the Bible series by She Reads Truth for the last 21 days and it has been so great. I love learning about all the women in the bible and what exactly Jesus calls us to be as women. It's nice to see that the women in the bible struggle with very similar things that we still struggle with today. (5) Football season starts in ONE MONTH. Even though I basically become a widow during football season (#ugarecruitingwife ;) I am so excited for it to be here!! (6) Adam + I are going out to look at 2 houses tonight with our realtor. We're both really excited to get out and see what our price range has to offer! I can not wait to have my own classroom and I can't wait for football!! On Sunday's I will watch every game I can!!! Good luck with the house hunt!! I'll be sending positive vibes your way! Good luck on the house hunting! And I cannot wait to see your warehouse purchases! So sad about the outfit pics! I'm excited to see what you ladies got! CU's first game is a month from tomorrow. I seriously cannot wait!! Have fun looking at houses! Hope y'all find something you love! Good luck with the house hunt! It can get stressful, be prepared!